What is 'Community Shares Motueka'? Community Shares Motueka is based on a concept of local currencies, which are a money-free way of trading skills within a community. Instead of dollars, credits known as 'Talents' or 'Hours' are used as payment. You earn these credits for goods or services you provide for other members, and then use them to access other goods and services from other members. Why join Community Shares Motueka? Community Shares add richness to members' lives. As a concept it brings ‘wealth', in the form of friendship, caring for one another, having our needs met from within our own community, getting help with things we can't do and strengthening our local community. Imagine having your car fixed, your house painted or your hair cut without spending a cent! Also skills that are often taken for granted (especially non market-economy skills) like parenting, basic home help and care giving. Friendships form between people of different backgrounds who would not otherwise have met. The elderly are cared for and the skills they share are valued. Young people earn time, to spend as they wish. The community becomes more inclusive, valuing everyone and their unique contribution. In other areas where local currencies exist, a stronger community has formed around them, especially valuable in times of crisis. Community Shares Motueka builds relationships and trust in our community. Everyone has something they can contribute to the wellbeing of the whole. There are two currencies in Community Shares Motueka: ‘Hours’ and ‘Talents’. Hours are based on a timebank system in which everyone's time is equal. No matter what type of work is done, one hour always equals one Hour. Every person is equally valued. Talents are based on Local Exchange Trading Systems in which both goods and services can be traded, with the ‘TALENT’ being the unit of currency. The value of the product or service is agreed upon by both parties to the transaction. What do YOU enjoy doing? What are your skills? These are the things you could offer to Community Shares. Also, ask other people what sort of help they desire or need. Our coordinator can also help you think of ideas. Below is a list to get you inspired! Sewing, tutoring, transportation, reading, arts, crafts, food, music, gardening, car or bike repair, home care, computer support, financial guidance, new and used items, cooking, hair and beauty, housekeeping, pet care, fresh produce, massages, photography, meditation, carpentry, dancing, games, events, language help, mentoring, jewelry making, translation, story-telling, respite, babysitting - the list goes on! And if you like to give your time but do not want to spend your earned Hours or Talents you can donate them to your neighbor, a community group or the community chest to be used for the common good. 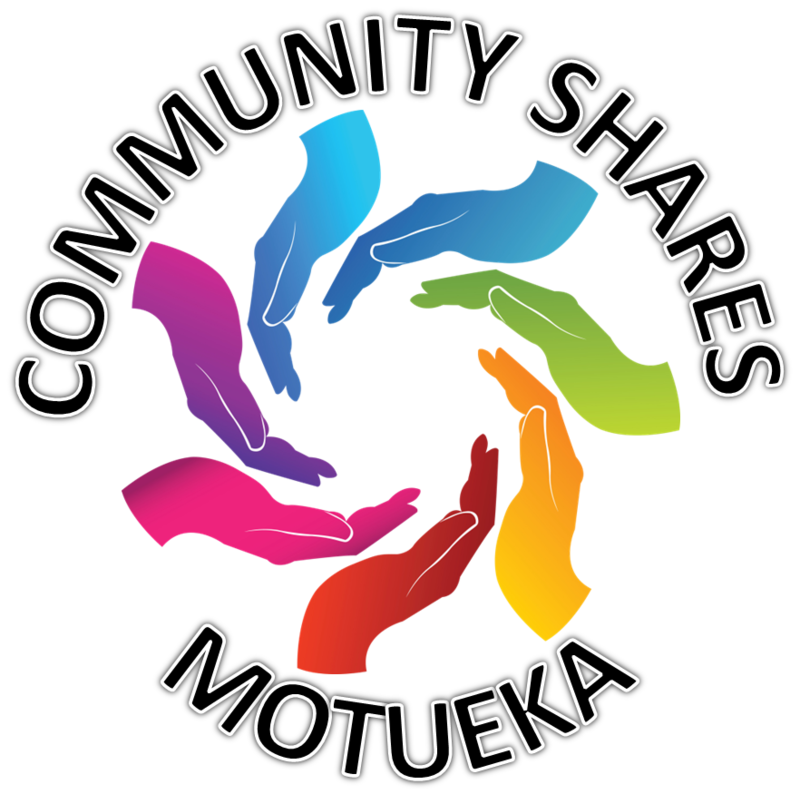 Who can join Community Shares Motueka? Anyone of any age, skill level, economic standing or ability can join and everyone has something to give. Anyone in Motueka or surrounding areas (between Riwaka and Mapua, Marahau and Tapawera) is welcome to join. You will receive 2 Hours as a welcome gift when you sign up. There is an annual membership fee of 2 Hours, which is charged ½ Hour quarterly. If you live closer to Nelson, you may want to consider membership of Community Shares Nelson (www.nelson.cosh.net.nz), or be part of both if you'd like to trade with people in both communities! Who started Community Shares Motueka? A group of people in the Motueka area came together in May 2013 after some of us learned of Time Banks popping up like mushrooms all over New Zealand and beyond. All of us are passionate about creating alternatives to the current monetary system and building strong, resilient community and some are already involved in community currencies. We have since amalgamated with the Tasman Area Local Exchange Network and Trading System (TALENTS), are also collaborating with Community Shares Nelson and aim to trade throughout our wider region soon.